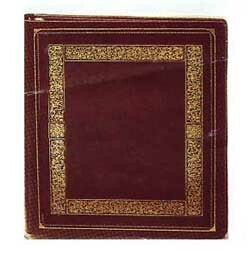 Classic binder of fine leather with ornamental gold tooling on cover. Matching lining in silk moiré. 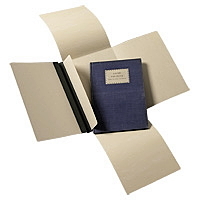 Each binder includes 10 free ULTRAFILM acid-free protectors and acid-free fillers. 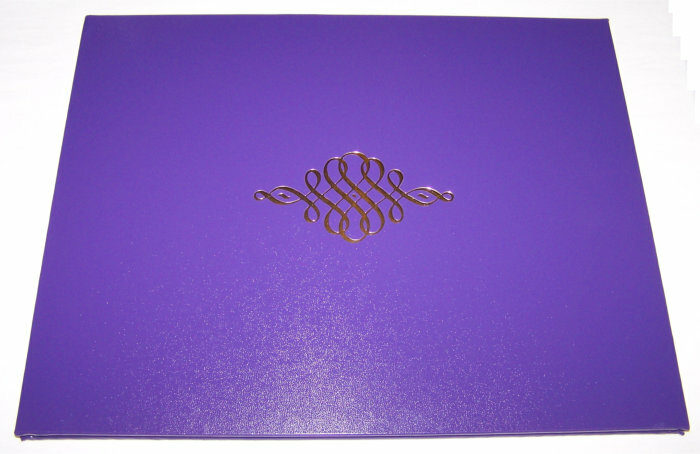 Gold hand-tooling on cover in luxurious design on the finest top grain leather. Built-in easel sets up easily. Folds into flat binder when closed. Sturdy boards. Black leather-look. Made in U.S.A. Hand-Finished. 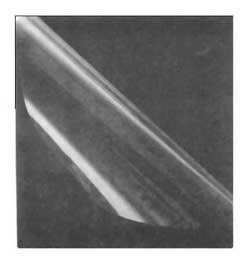 10 acid-free ULTRAFILM protectors, with acid-free fillers, included with each binder. 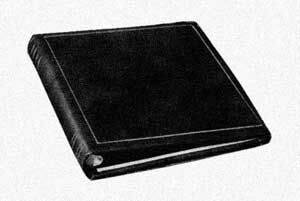 Leather-look padded covers that fold like a book when closed. Gold trim. Lined with silk moire. 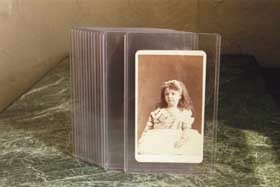 ULTRAFILM acid-free clear window on inside, with acid-free paper mat for display. No. 244-C ... New! ... 14 x 11" ... 37.50 ea. 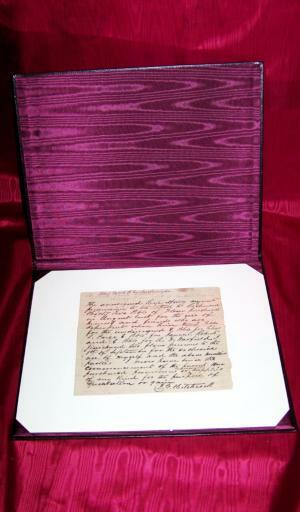 "Authentic Memorabilia from the American Revolution"
Multi-ring, sturdy hard cover library-weight construction. Black leather-look. • Acid-free covers. • Acid-free lining. Wonderful display showcase for large documents, newspapers, special items, art reproductions, broadsides, maps, and large exhibits. A favorite for long-term use, Easy and safe retrieval of documents. Hand finished. Made in U.S.A. by skilled craftsmen. Exclusively ours. Capacity: 30 Protectors (60 sides). FREE with each binder, 10 acid-free ULTRAFILM protectors, with acid-free fillers. For photos, artwork, documents, and more. 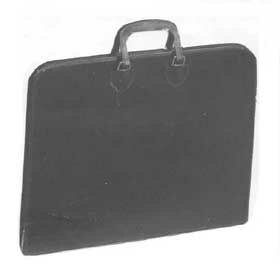 Multi-ring Giant Binder with zipper on three sides, and carrying handles. Lightweight. Clear, sparkling protector pages for long-term use. Double the weight of commercial protectors. Easy and safe insertion and retrieval of documents. Laboratory tested; 100% inert. The ultimate in purity, safety and quality for storage through the ages. * Acid-free fillers included in all sizes above. Acid-free, 2 mil, 100 feet long x 40" wide. For large and unique sizes. Cut as you need. 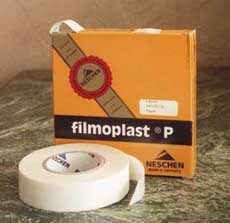 For encapsulation, use with Tape No. 100 below. Mini roll: 50 feet long x 20" wide. 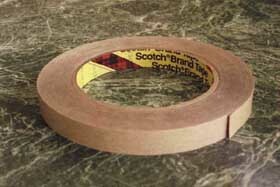 Clear, coated-both-sides adhesive tape, used by Library of Congress for encapsulation. 36 yds. x 1/2" wide. Transparent non-glare finish. Reversible. For general archival use. In dispenser box. Pressure sensitive. White acid-free. Heavier than our no. 412-AR. Suitable for repair of bound materials, edges of documents, hinging, framing, matting. 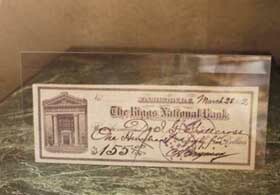 Crystal clear "Mini Protector," multi-purpose for checks, postcards, currency, covers, stereo cards, etc. 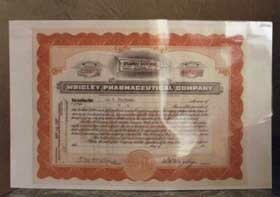 Perfect size for stock certificates and legal documents. No holes, 4 mil Mylar, open at top. 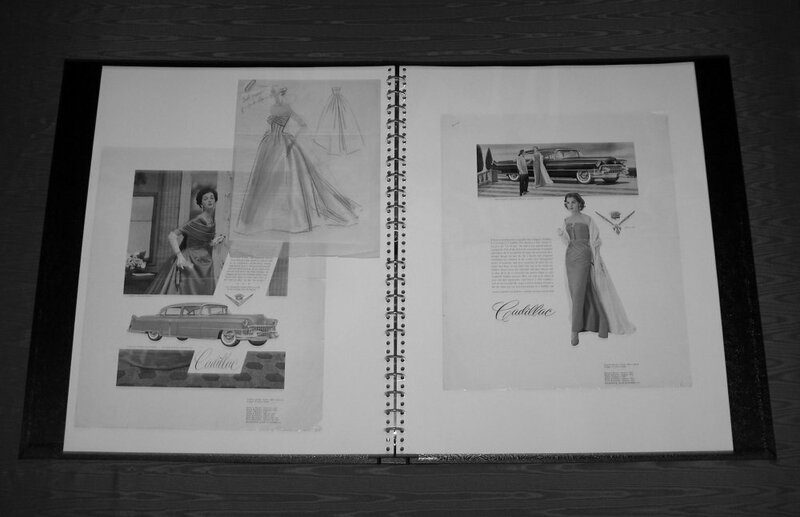 For cartes, sports cards, documents, photos, letters, and many other items. 3 holes, 4 mil Mylar, open long side near holes. No holes, 16 mil clear. Unplasticized rigid P.V.C. free of stearates. 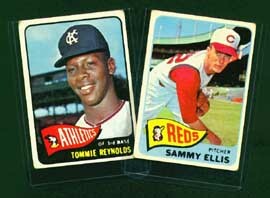 For sports cards, photos, maps, cartes, documents, and other items. Brilliantly clear to protect oversize prints, posters, maps, newspapers, art, etc. 4 mil. Sealed on 2 sides (one long, one short), for both safety and convenience when placing your item in protector. 5 pcs. min. order per size. 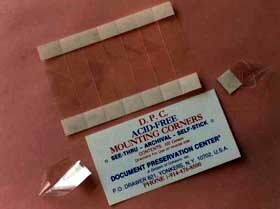 Pre-scored, fold to use, 5/8"
Pre-formed, ready to use, 1/2"
Acid-free museum quality mat board, 2 ply. Ivory. For framing, backing, mounting. Use as mat, filler, or mounting. 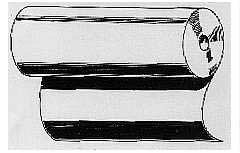 For labels, political and other ribbons, swatches, cards, salmon cannery labels. Ribbed translucent plastic. Acid-free protection on your shelf. Also suitable for storage of pamphlets, publications, magazines, bulky materials. Closes with two Velcro dots. Capacity: 5 discs in sleeve. Snap lock fastener. For document, print, and pamphlet storage. Place document in center. Close all four flaps. Cloth spine permits labeling and shelving. Made of archival board. A museum-standard product. No. 427 ... 7-1/4 x 10-1/4" ... 11.97 ea. No. 428 ... 9-3/4 x 12-3/4" ... 15.92 ea. Minimum order 10. Sizes may be assorted. 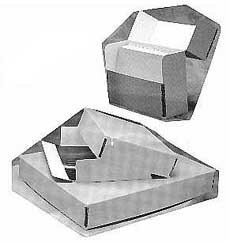 Archival quality, 3 hole, sealed three sides, top-loading, protective margin guard in hole area. No. 145 ... 66¢ ea. No. 146 ... 66¢ ea. Either ... 66¢ ea. No. 148 ... 66¢ ea. No. 149 ... 66¢ ea. 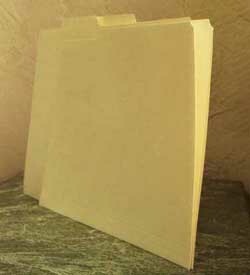 Extra Heavy Duty folders have additional scoring at bottom fold, for extra capacity. All components are acid-free...inside & out. 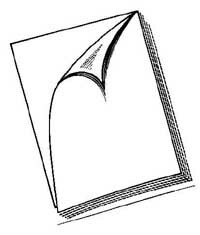 Three rings accept Pocket Pages above, or three-hole protectors up to 11-3/4" high. D-style rings for easy turning. Stainless steel finger hole on spine for convenient shelf retrieval. 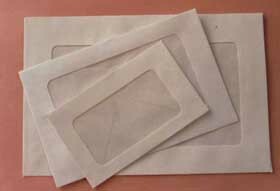 Non-toxic method of neutralizing paper. Easy to use. Recommended by librarians. Dries odor-free. Made of non-hazardous materials. Acid-free, non-toxic, reversible. Not affected by heat or cold. Non-staining. 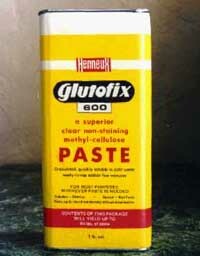 Easy to use: mix as needed. 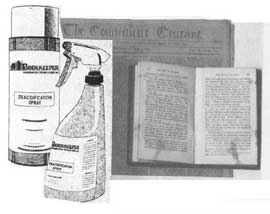 For repair and conservation. 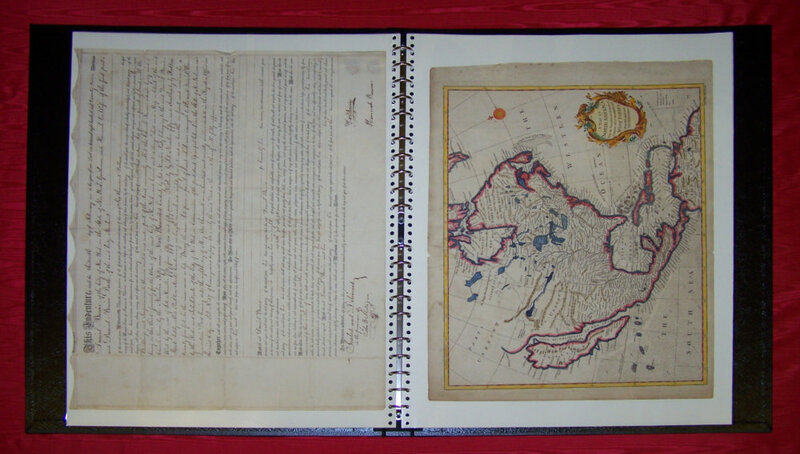 Archival boxes, acid-free. Buffered, no lignin, no alum. Fade-resistant. Strong grey board, white interior. 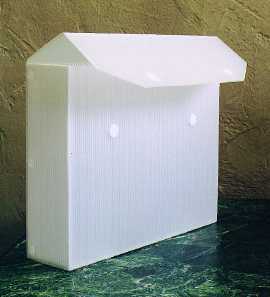 Storage box – Contains 20 sections, each 2 x 2”. For small artifacts, medals, jewelry, buttons.. 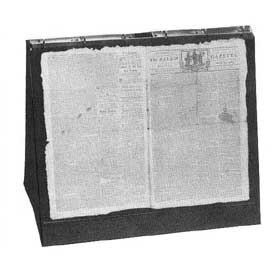 Newspaper box - Separate lid. Light oak woodgrain one side, white other side. Two-ply. 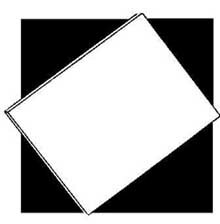 Use for framing, mounting, or special project. Not acid-free but a hard-to-find item! No. 322 ... For 12" LPs ... 31.70 ea.